Matthias Weischer conceives his painting Wurm as if it were a sculptural assemblage. Weischer treats the paint as a construction material: thick impasto is carved into, painted over and chiselled back again; other areas trail off into thin ephemeral drips. 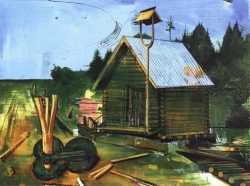 His log cabin and scattered debris take on a clunky, rustic form, their implied weight and physicality undermined by the persistent awareness of the painting’s battered surface. 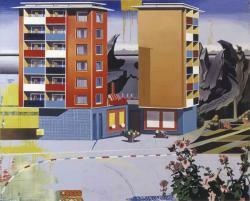 The three pronged abstract shape is revisited in several of Weischer’s paintings, such as Familie O-Mittag . As if part of a stage set, Weischer’s forms become recyclable props, implying an inter-relating continuity between his imagined spaces. Matthias Weischer’s dream houses defy all spatial logic; he makes architectural installations that can only exist in two dimensions. Depicting a ceiling-less apartment, Egyptian Room removes the ambit between internal and external space. Instead, each element imposes its own sense of order on each other: outside, palm trees and sand dunes tower in geometric precision, while inside Matthias Weischer’s meticulous grid gives way to its own organic confusion. The floor melds inconspicuously with the counter, shelves and table tops tilt to high-seas angles, and objects such as the basket sink below their supporting surfaces. Banality is ruminated as a perpetual labyrinth where obsession and madness become the pursuit of wonder and delight. 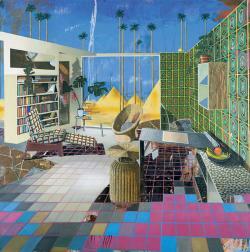 House operates as an antilogy: a painting that’s a contradiction of its own expression. Subverting the expected qualities of painterly rendition, Matthias Weischer invents an environment where each element adopts attributes opposite to their character. Flowers in the foreground recede with the flatness of wallpaper, while rugged mountain backdrops protrude with stylised sharpness. Hard-edged formalist tower blocks exceed planate limitation to create believable sculptural volume, while details nearest in perspective float in non-descriptive nether-space. Smudges and drips of pure abstract gesture should lead the eye directly back to the painting’s surface; instead they create a disorienting tiered perspective. Matthias Weischer creates a common urban scene as a surprise of improbable construction, exploiting illusion to its ultimate possibility. 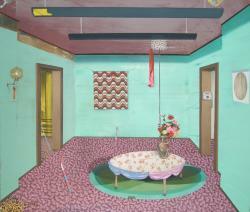 Matthias Weischer’s paintings of interiors expose the architecture of painterly illusion. His rich surfaces contrast geometric fields of hard-edged abstraction with highly rendered decorative details to create an eerie play between flatness and 3D. Starting with a design of an empty room, Matthias Weischer builds his imagined locations layer upon layer, each added element further pushing the boundaries of perceived space. Incongruous perspectives, dizzying patterns and Escher-like visual riddles quietly allude to a sense of the uncanny. In Living Room, suburban normality is infiltrated by an almost unnoticeable surrealism: shrubbery on the inside of the building, an impossibly flat piano and a table that casts no shadow. Matthias Weischer’s composite paintings readily portray space as a surreal concept. In Untitled 11, Weischer creates a scene of diametric character: a grotty alley is given the smooth lighting and design effects of an institutional interior. Viewed over a railing, his set shuffles in and out of optical perspective. Shifting between representation and abstraction, breeze blocks repeat in Op Art patterns; a wall mural is a self-contained painting within a painting. A large white tower cuts through the canvas, a haywire scribble of spatial relief. Matthias Weischer off-sets this hard-edged style with his organic treatment of the ground: thin layers of oil paint ripple with the translucence of water. Plants and bricks suggest submersion, while the realistically rendered blankets float strangely on the surface. 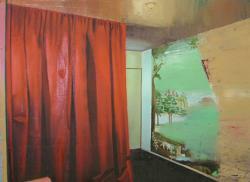 In Matthias Weischer’s Untitled, the artist constructs a claustrophobic room with fraudulent perspective. The airy turquoise space is squashed between the heavy mauve planes of ceiling and floor; only a too-tall standing lamp keeps them prised apart. The precariousness of the scene is repeated throughout: a dwarfed table teeters on matchstick legs under the weight of a classical urn and striped sticks appear to stand on end, placed at deceptive angles to the ground. Matthias Weischer emphasises the ‘askance’ effect through the patterning of the carpets, tablecloth and wall hanging, each appearing out of turn in their layered spatial order. Matthias Weischer’s paintings explicitly show the falsification of their illusion. 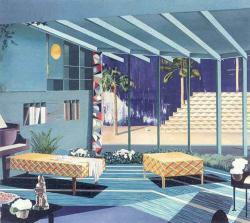 In Familie O-Mittag, Weischer doesn’t create a room, but rather a complex system of intersecting rectangles. 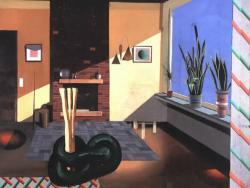 Here, the floor, window, wall and hearth exist as separate planes: the representative scene functions as a coincidence of their proximity. This geometric breakdown is extrapolated further in the bricks, tiles, picture frames and plant pots, dissolving the image of a room into an obsessive hallucination. Matthias Weischer’s Interior sets up an ambience of corroded decadence. Here Weischer’s formalist interests are presented with more naturalistic qualities. Exploiting his media to its full potential, Weischer creates spatial illusion through his application as well as composition: the heavy folds of the curtain are painted with concrete ballast, while the ceiling writhes with liquid fragility. Weischer renders the receding wall with battered texture, the illusion of movement gives way to a fanciful mural; a portal to a mystical landscape, incongruous with this dilapidated setting. Was ihr wollt, Ruhrfestspiele Recklinghausen, Theater Marl in cooperation with the Renaissance-Theater Berlin and Grand Theatre de Luxembourg.